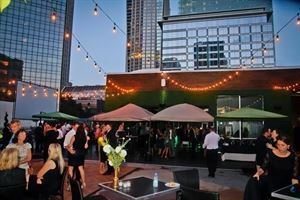 From intimate cocktail parties and corporate luncheons to lavish wedding receptions under the stars, Rooftop 210's experienced staff will help you create a distinctive, unforgettable event. With unparalleled service, an incomparable location and more than 25,000 square feet of open-air seating, banquet and dancing space, your next event is a guaranteed success with Rooftop 210 at EpiCentre. Rooftop 210 can be completely enclosed for a more private setting and the fully-equipped Bud Light sound stage – ideal for musical performances. We play host to a variety of events throughout the year, including concerts, fashion shows, festivals, weddings, private parties, sporting events – plus Rooftop 210 is home of Alive After Five, Charlotte's largest weekly happy hour and free entertainment celebration.